For 15 years, Brainsight has been setting the standard for functionality and ease of use for TMS and veterinary neuronavigation and we are bringing this to bear for fNIRS. The result is a seamless marriage of acquisition control software and neuronavigation. 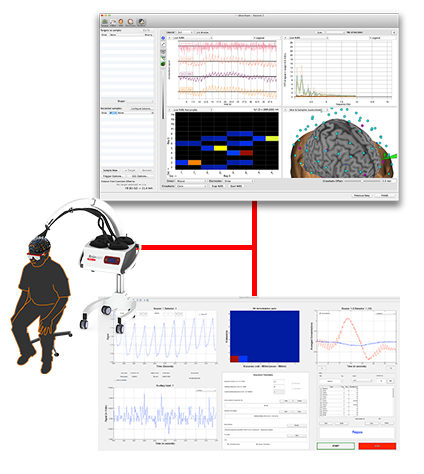 This approach gives you the capability of mapping all your fNIRS (as well as your TMS, EEG and EMG) to either standard brain template (e.g. MNI brain), or to the subject-specific MRI. You can decide how much precision you need and consequently how much effort is acceptable. This is not an add-on to pre-existing acquisition software, but designed this way from the ground up. 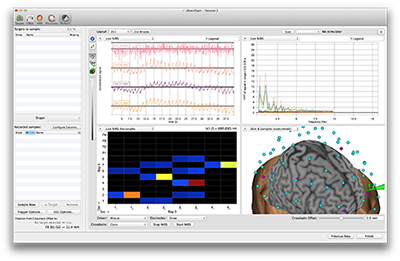 Our montage manager enables you to define your common fNIRS and EEG configurations for quick recall at the start of a fNIRS session. The locations of the optodes can be defined in a similar way as is done in EEG. The initial locations can be defined in a standard 3D coordinate (MNI space) and automatically mapped to the individual’s MR images. 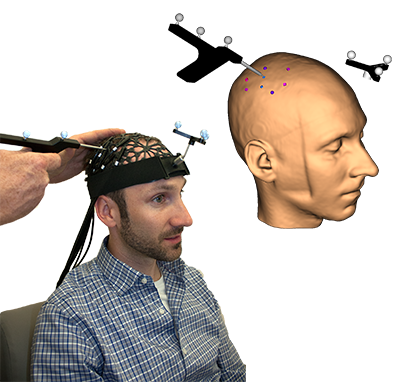 The tracked pointer can be used to further refine the actual location once the optodes are placed on the head at the start of the fNIRS session. 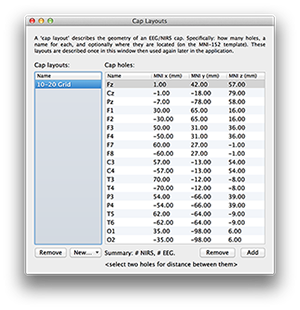 If you perform the same montage of optodes (and/or EEG electrodes) on multiple subjects using a cap to hold the optodes, you can define the cap once using our cap manager. The definition can contain the 3D locations of each optode in the standard MNI space as well as the intended purpose of the optode, be it source or detector (as well as EEG electrode). 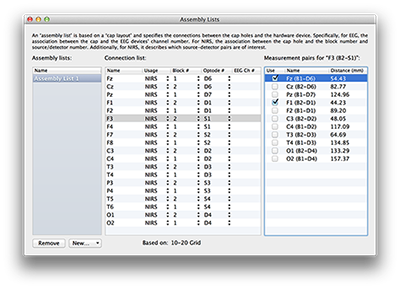 This cap and assembly list definition can be instantly applied at acquisition time for the subject either to the standard template brain (if no subject MRI is available), or warped to the subject specific MRI. If maximum precision is needed, you can use the 3D tracked pointer to record the exact location of each optode and Brainsight maps it back to the subject specific MR space, or to MNI space (or both if desired). You can use a full cap, or a patch that optimizes coverage over your target area. The locations of the optodes/electrodes can be pre-defined in the MNI standard coordinate space, or you can use the neuronavigator to accurately digitize the locartions and map them to the subject-specific MRI. Brainsight gives you total control over the acquisition parameters, including the gain of the APDs and the digital amplification so you can ensure that you are getting the best acquisition possible. The real-time display alllows you to explore the effect of changing the parameters before starting the acquisition. Once you are ready, performing the experiment is as easy as clicking the start button. Watch the data as it is acquired using the flexible display options. The data is exported in the open standard “.nirs” format for use with any common analysis software (e.g. HomER, NIRS-SPM). 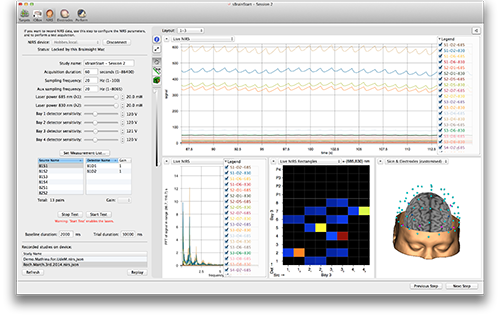 In addition to the Brainsight computer, the Brainsight NIRS unit can export the raw fNIRS data in real time to other clients, including Matlab. You can use this feature to perfom you own custom analysis in real time.